The weather begins to shift, the wind picks up, and the leaves on some of our Bay Area trees prepare for winter. As humans, we are predisposed to change. It keeps our lives fresh, our brains fed, and our souls nourished. Qi must move in order to stay alive. I am thrilled to announce a change in my practice location. I have the wonderful opportunity to branch out to not just one but two new offices. I enjoy bringing peace to the hustle bustle of downtown, so I will maintain a Financial District presence. In addition, I will be able to treat a variety of people from other parts of San Francisco in my new Castro/Duboce location. In my downtown location I will be working alongside a friend and colleague I have known for 20 years, since we began our acupuncture master program in 1997. In my second location my office will be solo, in a suite with therapists — a lovely, quiet and serene place to take an acu-nap. Tomorrow is Game 1 of the 2012 World Series–the San Francisco Giants against the Detroit Tigers! Not everyone reading this post is a baseball fan, but keep reading to see how similar we are to all of the Giants and Tigers players. Professional baseball players have gotten where they are for a variety of reasons: talent, luck, and physical conditioning, among other things. You may think that you have nothing in common with professional athletes, but you do. One of the key elements of their success is their team of health care providers both on and off the field. Without this team of medical professionals, these athletes would not be where they are today. What does this mean for the rest of us? We all have our own team of professionals. Look around you — who are the ones who keep you going on a daily basis? Who helps you out when you’re hurt or ill? More importantly, who helps keep you going when you are well? Wellness care is equally essential, if not more, than intervention during illness. In fact, in ancient China, doctors were often fired when their patients became ill! 3) Gather your friends. Maintain your friendships, be active with them, make meals together, enjoy cups of coffee or glasses of wine, and be sure to laugh on a regular basis. Posted in Acupuncture, Wellness care, What's your health worth to you? 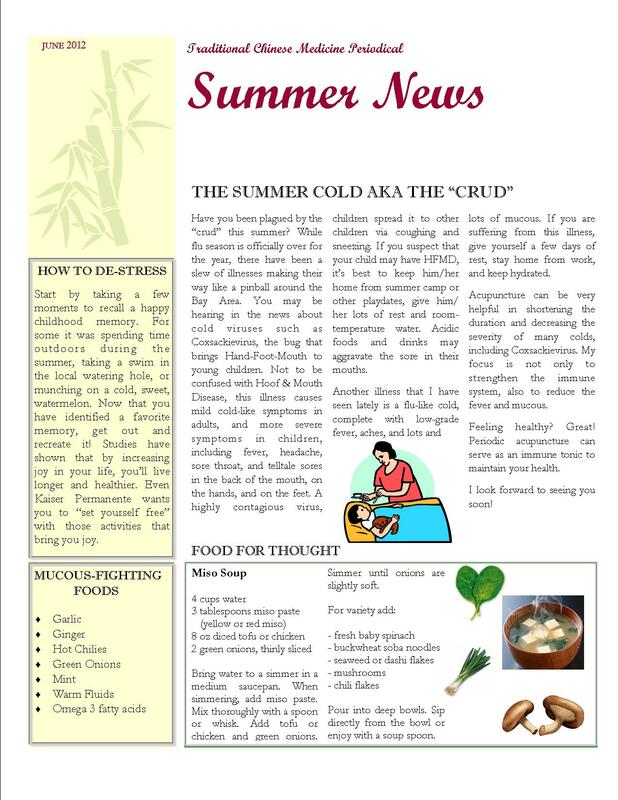 The summer acupuncture newsletter is here! The Great Health Care Debate: Who Receives Acupuncture More, Women or Men? Who seeks acupuncture more, women or men? In my practice, the number of women I see is well more than double the number of men. Women’s reproductive systems are more complicated than men’s, thus women are more likely to seek care for hormone-related issues. However, in a family practice such as mine, this should not account for the high proportion of female patients. Given that I treat pain, stress, insomnia, digestive issues–really anything related to inflammation, where are the men? I know that men are active, have pain and injury, experience stress and insomnia, so how are they treating themselves? Or are they? I often hear from women that they are trying to get their male partners to try acupuncture. They love it, and just know that their partner would also love it. More often than not, it’s the wife or girlfriend who makes the appointment for her partner. When I probe my female patients as to why their partners are hesitant to try acupuncture, they typically tell me that their partners don’t like going to the doctor or are afraid of needles. As some women describe it, he’s got to have his arm dangling from his body in order to seek medical attention. This begs the question, what does it take to reach out to men? Do men need to be in crisis to seek medical care? Take a moment and add your two cents. Posted in Wellness care, What's your health worth to you?